Kutaa har’aa keessatti dhimma garaagarummaa kaffaltii saalaa haawaasa keenyaa keessa jiruu mari’anna. Yooyyaa! Gara English Together kan mata duree tibbanaa irratti mari'annuufi qooqa ittiin dubbachuuf si barbaachisu siif qoodnutti baga nagaan dhufte. Ani Caaliidha. Akkasumas Toomiifi Saam na waliin jiru. Hi everyone, I'm Tom. Welcome to today's programme. And I'm Sam, welcome to the programme. Kutaa har'aa keessatti waa'ee garaagarummaa kaffaltii saala gidduu jiru ilaalla. Gara odeeffannoo har'aatti otoo hince'iin dura, gaafiin har'aa kunooti. World Economic Forum akka raga bahutti, carraafi hirmaannaa dinagdee ilaalchisee biyya kamtu garaagarummaa saalaa haalaan olaanaa ta'e qabaa? I'm not sure either, actually. Utuma isin lamaan gaafichaaf deebii yaaddaa jirtanii, Worldhacks BBC World Service irraa odeessa argamee kana haacaqasnu. Odeessi kun, biyya Ayislaanditti rakkoolee kaffaltii saala gidduutti garaagarummaa uume furuuf waan dubartoonni Ayislaandi raawwatan dubbata. Right across Iceland on October the 24th last year, the women left work early, shaving 30 percent off their working day because in Iceland, they take home, on average, 30 percent less pay than men. Since then, the government has brought in rules that will make Iceland the first country to put in place a rigorous system to try and force companies to provide evidence that they're paying men and women equally. 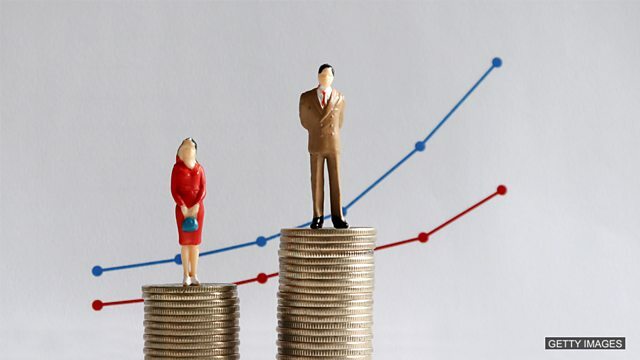 Globally, on average, women take home just over half the wages of men, according to the world economic forum. Well, good on those women in Iceland. I think it's outrageous that women are still paid so much less than men. Wow, steady Tom. Didn't think you'd feel so strongly about this topic. I'm sorry, but there are a lot of women in my life who are very special to me and the idea that they take home less than men for doing exactly the same work, really upsets me. 'Take home' jechuun ashuuraa fi kanneen barbaachisan biroon erga hir'ifamanii booda, maalaqa fudhattee galtuudha. I couldn't agree more, Tom. Sounds like this topic is very personal to both of you. But, I have to say, I wasn't really that surprised to hear that globally, women take home just over half the wage of men! I'm lost for words. I think we really need to do something about the issue of this gender pay gap. 'Gender pay gap' jechuun garaagarummaa kaffaltii saalaa gidduu jiruudha. I think this is a problem in every part of the world. 'To discriminate against' jechuun loogii irraan gahu. Tole, mee bakkuma kanatti deebii gaafii battalee har'aa sitti himuu? Carraafi hirmaannaa dinagdeerratti biyya kamtu garaagarummaa saalaa haalaan olaanaa ta'e qaba? Deebiinsaa a) Hindiidha, haala walitti dhiyeenya qabuun lammaffaan Koriyaa Kibbaa akkasuma sadaffaan Itoophiyaadha. Didn't the news story say something about what Iceland is doing to tackle this issue? Ah yes, so to stop companies discriminating against women, they're going to put in place a rigorous system whereby companies have to show that they're paying men and women equally. 'Rigorous system' jechuun sirna xiyyeeffannaa ykn eeggannaa cimaa qabuun. What a great idea. Yeah, but if you really want to get rid of the gender pay gap, I still think there's a lot more that we could be doing. Exactly! Why not just make everyone's pay known to everybody else. This way, we'll all know exactly who's taking home what. The perfect solution Tom. In fact, why don't we do it now? On the count of three, we tell each other how much we're getting paid. Aren't you two getting carried away a little? Waan isan gaabisiisu utuu hin raawwatiin dura yoo golobne maal sitti fakkaataa ? Addunyaa keenya har'aa keessatti garaagarummaa kaffaltii saala gidduutti godhamu hir'isuuf maal gochuu qabna? Tole, torban kanaaf nagaa ottoo sitti hindhaamiin dura, jechoota har'aa irratti dubbachaa ture haa ilaallu. "Take home" Ashuuraafi kanneen barbaachisoo biroon erga hir'ifamanii booda maallaqa fudhatanii manatti galaniidha; "gender pay gap", jechuun garaagarummaa kaffaltii saala gidduu jiruudha; "discriminate", jechuun loogiidha; akkasumas "rigorous system" jechuun sirna xiyyeeffannaafi eeggannaa cimaa barbaadu jechuudha. Turtii waliin qabaanneef galatoomi; barnoota dabalataa "English Together"n torban ittaanu walitti deebina. Nagaatti. Haala walqixaaaa hinta’iniin namoota tajaajiluu ykn ilaaluu. Akkaataa ykn haalawwan ittiin hojiin hojjetamu.